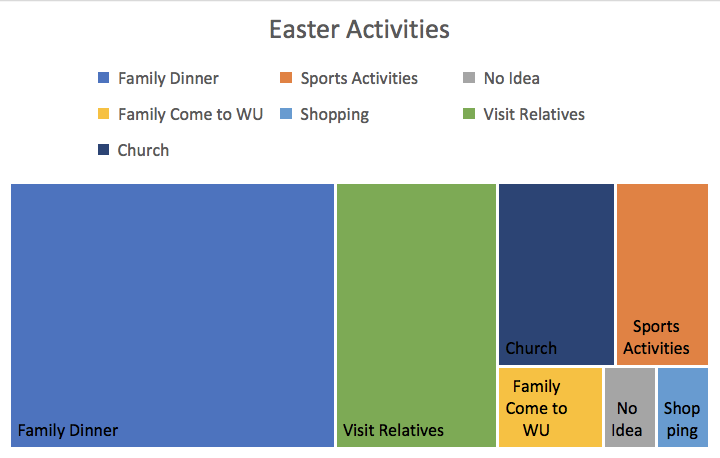 Easter is in two weeks, and Waynesburg University students are making plans for their extended weekend. To see what some students are planning for the four week break, 52 students were asked about what their plans are for Easter break. 46 of the 52 students who were surveyed are going home for the weekend. While at home, the students will spend time with family, visit relatives and eat an Easter meal as the main part of their agendas. Four of the survey group emphasized they would go see their grandmother. Three students said they participate and/or aid in a family Easter egg hunt. A couple students said they are going shopping while at home. While more may attend, only seven students mentioned attending church Sunday morning. For many, this is a yearly tradition in their family. Five students said they are staying on campus. Two were members of the baseball team. They said the team is staying on campus because of games on Saturday and practices. The football team is allowed to go home, but must return to campus Easter Sunday, said five football players. One soccer player said the soccer team is able to stay at home the entire extended weekend. Some students are staying on campus to celebrate Easter. For two of these students, it is easier if their families come to the university so they can celebrate together. This is to save on gas money and prevent trips to and from the university. For others, staying at home for an extended weekend does not justify the travel. With no sports or school work to do, one student said they will hangout alone or celebrate with each other. One student admitted they are not sure what plans they will have for the holiday. Another said they are not sure what they will be doing because they are celebrating with a relative for the first time.